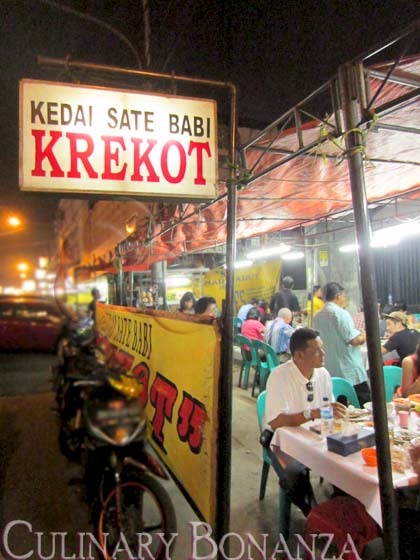 The next pitstop in our Pecenongan Fodder is Kedai Sate Babi Krekot, which is located right across Alila Hotel. It was Wednesday evening, around 7 PM wen we arrived the area, as usual, there was traffic jam, especially near the Redtop Hotel stretch, luckily, it quickly dissipated. 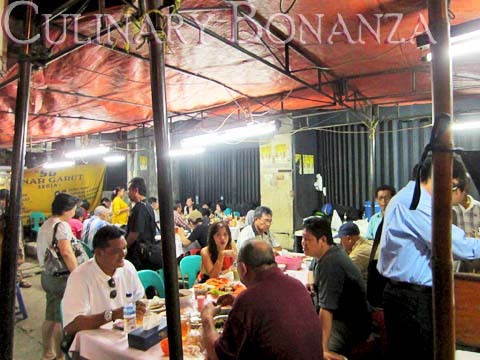 I want to comment on the price first, which is quite steep for street food standard. 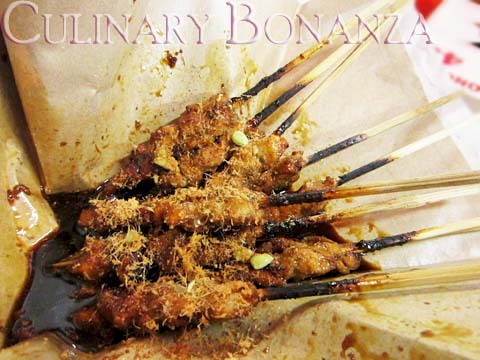 It cost IDR 50,000 for 10 skewers of lean pork! Other street foods that I've had in my life had never fetched such an expensive price tag. Is it because it is pork? The expensive rental fee? Or something else? This version of pork satay doesn't use peanut sauce like most satays do. Instead, the seasoning uses mainly sweet soya sauce and a sort of light brown flakes, that I suspected as ground dried shrimp (ebi). But it didn't have that pungent fishy smell that ebi usually has, so I'm totally clueless. A reader later enlightened me that the "brown strand of beauty is galangal (lengkuas), a common condiment for sate babi manis". Thanks a LOT whoever you are - too bad he/she is too shy to leave a name =( To add more zest in the satay, squeeze a dash of lime that comes served with it. Good thing is that the pork is lean, no crunchy or chewy chunks that I'd usually take the pain to separate in other satays I've had before. *) No Tax & Service Charge. No takeaway charge. You are not expected to tip. It's packed! Lucky we had ours as takeaway. Oh honey, it's almost funny how clueless you are. That brown strand of beauty is galangal (lengkuas), a common condiment for sate babi manis. Pecenongan is well-known for its steep price, which is relative anyway, since you shudder at 50k sate babi but totally ok with 75k martabak. Really? There aren't many non-halal places in Jkt? Maybe you're just not observant enough. Btw, why would we care about the ethnicity of the patrons visiting this place? Hey there! Thanks a lot for your info! I really didn't know that it was lengkuas...how ignorant me! About the price, I guess it simply reduces to the fact that I'm carzy about martabak. Gotta admit that I tend to overlook the price when I like something ;) but you're absolutely right, 75k is indeed, steep for martabak. 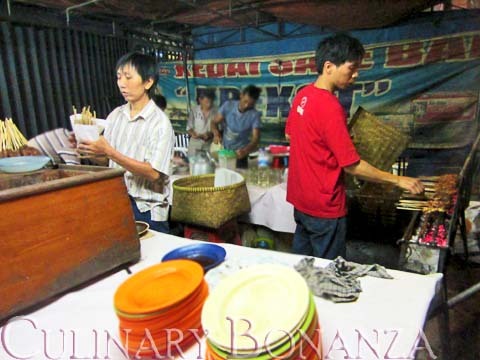 Agree with Aris M, Sate Babi in Kapuk is such a legend.. I know this is an old post but I just went here last weekend, and I think their sate is pretty ordinary but the bakut soup is refreshing with a good amount of sourness. I loved it. Hi Ellyna, I think Jessica was referring to salty meat bone soup (alias bak kut sayur asin yang ada di mana-mana ntu tuh) instead of bak kut teh. I don't know any good bak kut teh place in Jakarta, I still think the best bak kut teh in Indonesia can only be found in Sumatra area. Kalo ada yang tau tempat bak kut teh enak di Jakarta, tolong bagi-bagi info yak!